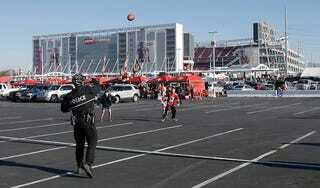 The San Francisco 49ers have their shiny new Levi’s Stadium in Santa Clara, but they want more. (NFL teams are never satisfied and will run over your grandmother with a steamroller if it means just one more square foot of space in their stadium.) The 49ers are offering $15 million for 10 acres of nearby land currently used as fields for a youth soccer league, so they can turn it into parking lots and whatever else they want by 2017. Silva said the roughly 2,000 kids in his league practice or compete on the three fields almost every weekday and most weekends during soccer season. He fears losing access to the fields would force the league to downsize dramatically. Mayor Jamie Matthews thinks the two sides can work something out—he and the city council could vote on the proposal in two weeks—but former mayor Patricia Mahan doesn’t see how Matthews could find new land for the youth leagues. She believes the city will take the money without a clear plan in place for new fields and screw everything up.